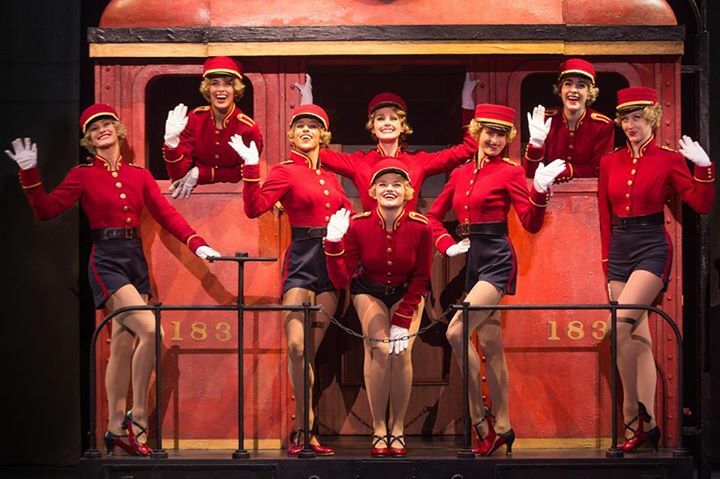 Much in the touring production of Woody Allen’s “Bullets Over Broadway” is directly from the musical’s unwarrantedly short 2014 Broadway run. Susan Stroman’s gravity-defying dances, re-created for the road by Clare Cook, are especially thrilling to revisit, and Allen certainly knows how to trigger a gag line and make it funny in a multiple of ways. The main criticism of “Bullets” when it opened in New York was its score. 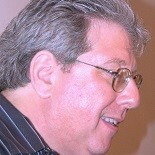 Rather than writing or seeking original music for the stage version of his 1994 movie, Allen opted (after working a while with the late Marvin Hamlisch) for vintage tunes, some familiar like Cole Porter’s “Let’s Misbehave,” some obscure and some nifty curios from Allen’s vast knowledge of the American songbook and jazz. Two problems prevail, and neither has to with music. One regards pacing. The other involves casting. “Bullets Over Broadway” needs to be zippy and jaunty, words that as I write them make me think of two chimpanzees. It needs to flow, almost race by so the razzmatazz of the 1920s and Allen’s chosen score has theatrical vitality to match the speed of Allen’s wit. A faster pace also sets up Stroman’s acrobatic and verve-filled dances because it makes them seem more integral and less a last-thought inclusion to give the speaking characters time to change their costumes. As Jeff Whiting’s production, also modelled after Stroman’s original, enters its second month on stage, everything you see seems like a sudden afterthought. The timing of the show is so disjointed, it plays more like a late rehearsal than a finished product, The seams in Allen and Douglas McGrath’s are so perceptible they yawn for catgut to knit them together. It’s as if every line, movement, sequence, and scene is being blocked on the spot. Everything seems separate, deliberate, and unnatural. Whiting’s staging is all effort and no cohesion. You see actors working at putting on a play rather than characters living their lives. You can knit whole sweaters in the pauses between what should be snappy comeback, and a complete inventory for Target’s winter scarf collection in the space between scene changes, especially when a dance number approaches. The drive is filched from the show Stroman and Allen assembled. You can appreciate individual lines and bits, Diva actress Helen Sinclair’s delectable “don’t speak” works time and again. In general, Whiting’s production is too slow and too careful to create the froth of which “Bullets” is capable. It’s like we’re seeing an earnest college attempt at a big Broadway show instead of the genuine article. Time may heal this dilemma. Scenes can jell, or Whiting can come in and clap his hands to a beat appropriate to the pace at which “Bullets” should move, but something must be done, or audiences throughout the U.S. will think “Bullets” didn’t make in on Broadway because it was too dull, obvious, and mannered for words. Casting is the more curious and less reparable of the problems. Everyone in Whiting’s production is good, with Emma Stratton as Helen Sinclair, Rachel Bahler as Eden Brent, and Bradley Allan Zarr as Warner Purcell being terrific. The problem is you have about ten performers giving laudable performances in different shows. Just as the timing of Whiting’s production seems clunky, the performances of his actors fail to mesh. I enjoy the youthful, committed, and almost innocent traits Michael Williams brings to the lead character of playwright David Shayne, who wants to get his socially charged commentary on life produced on Broadway and has standards that fade in the wake of both theatrical and romantic reality. Shayne, with a quiet voice that contrasts with all his co-stars, most playing Thespians or gangsters and therefore given to volume, and a nonchalant ease in his carriage and movement, convinces you on the spot he is an eager, yet unnoticed writer who believes what he has to say will enlighten humankind to a profound extent. Regrettably, Williams’s performance only works in isolation. When he meets and is seduced by Helen Sinclair, you can enjoy Allen’s plot, but there’s no connection between Williams and Emma Stratton even though on every other level, they’ll playing the parts excellently. It’s is the same with Williams’s byplay with Jeff Brooks, who plays the gangster, Cheech, who proves he has an ear for dialogue and no tolerance for actors who mangle his compositions. The relationship between the artiste and the artistic hood stays cold. Scenes involving the pair work from a structural point of view and certainly supply ingenious segments of Allen and McGrath’s story, but they are not as comically delightful as they could be, and were when Zack Graff and Nick Cordero were playing the parts on Broadway. Sequences between David and Cheech seem more like necessary plot business rather than funny interchanges between fish from two different oceans, both of whom can be passionate about his opinion but each of whom see the value in collaborating. The David-Cheech segments are the heart of “Bullets Over Broadway.” They set most of what happens into motion, especially the plot line involving mob boss Nick Valenti and the chorine, Olive Neal Valenti’s moll he insists have a featured part in the show he’s financing with his organized crime wealth. 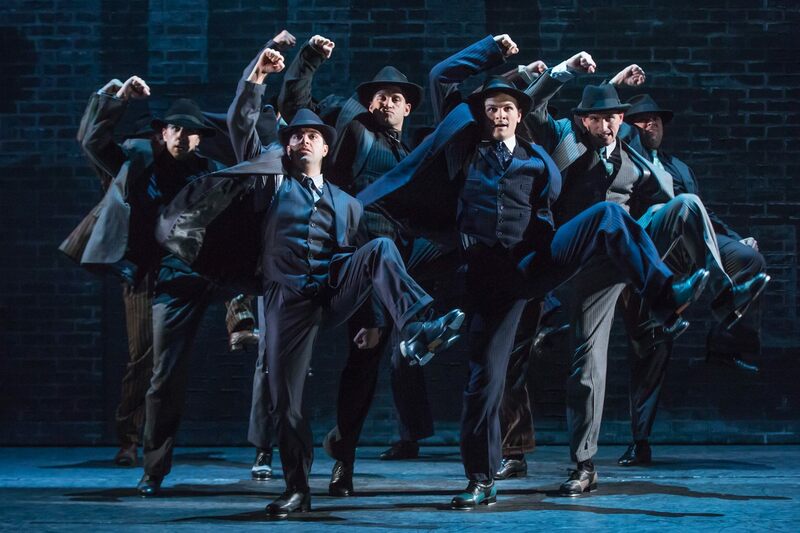 “Bullets Over Broadway” is a clash of two worlds, one artistic, one murderously criminal. Comedy derives from that unlikely juxtaposition. In Allen’s 1994 movie, and on Broadway, the clash created comic sparks that made “Bullets” a delight. In Whiting’s tour, you barely get embers of amusement. Everything remains on paper, in Allen and McGrath’s script. The stage is devoid of the loopy disparity of the characters. Williams lacks the fire to defend his work to the hilt. Brooks lack the charm to make Cheech a popular gangster. He stays tough and poker faced instead of being the regular guy who happens to kill for a living and had no conscience about it. Williams and Brooks go through the motions, but there’s no hilarity in their scenes. They happen. They don’t burst forward as being special and as the dynamic force for a show’s primary premise. This laxity pervades this touring production. All of the characters register as individuals. Few can take that individuality and turn it into the kind of personality conflict, or bonding, that makes a script into theater. The main exceptions are two who play characters that have the least to do and are the least consequential to “Bullets’s” success. Rachel Bahler, who as Eden Brent could pass for Nanette Fabray in her prime, has spirit that makes Eden come alive every time she’s on stage. Her second act opening number, “There’s a New Day Comin'” is one of the highlights of the touring production, performed with a liveliness and savvy you could only think were unattainable from anyone but the dance ensemble. Eden is almost an afterthought in the musical of “Bullets,” but Bahler finds ways to make her stand out and get some warranted attention. Bradley Allan Zarr is perfect as Warner Purcell, the matinee idol brought it to play opposite diva assoluta Helen Sinclair. He has all of the ego and pomposity of a stereotypical star and makes Warner loveable in spite of them. Zarr delightfully plays the character traits Allen gives Warner, particularly his gluttony — His mind is always on consumption, and he comically expands in girth and jowls as “Bullets” unfolds. — and his cowardice. Unlike the other actors, Warner is a tad nervous about the constant presence of mobsters, especially when he convincingly begins a relationship with the mob capo’s gash, Olive Neal. Zarr is also a fine singer. His and Jemma Jane’s rendition of “Let’s Misbehave” is one of the highlights of the production. Zarr is also stronger while introducing a production number of “There’ll Be Some Changes Made.” He is the most fun when Warner cringes after Cheech warns him to steer clear of Olive. You can find all of the ingredients for excellence on Whiting’s stage, but it will take work or more performances to hone it to where “Bullets” play as it should and provides the non-stop mirth of which it’s capable. It’s more of a mystery how all turned into such a hodgepodge than it will be to fix what’s wrong and set the touring “Bullets” on its proper keel. Among the better elements in the tour is Emma Stratton’s turn as Helen Sinclair. Stratton is every inch the star as Helen. She notices only matters that pertain to her, and she latches on to anyone who she thinks matches her luster and success. For a while, before Helen finds out the truth behind David’s script improvements, David is the object of Miss Sinclair’s designs. Stratton can play Helen’s selfishness while also making her likeable and welcome on stage. She can rival Bahler and Zarr in energy and is truly excellent when Helen wants to take things a little slowly and bask in her particular crystal-edged spotlight. There’s a core of reality in Stratton that only fades during allegedly romantic scenes with Williams’s David. “There’s a Broken Heart for Every Light on Broadway” shows her skill at taking a song to the house and holding audience attention. While singing it, Stratton summons the single movement of tangible feeling Whiting’s “Bullets” musters. She shows her more vibrant, and womanly, side while leading Williams’s David in “I Ain’t Gonna Play No Second Fiddle” Stratton lets you see Helen’s genuine jealousy and the wiles that will cure it by attracting David to her alone. Hannah Rose DeFlumeri, as Ellen, the tenement girl to whom David is engaged but ignores while he cavorts with Helen, earns your empathy, but like most of the cast, she does it in a theatrical vacuum in which she is doing her job in playing her character but doesn’t seem to relate when she’s playing scenes with Williams or with the man Ellen sees on the rebound, Sheldon Flender. Jeff Brooks is the most mysterious as Cheech, the gangster who freshens David’s dialogue to make it more realistic and immediate but who croons “Up the Lazy River” as he escorts the unlucky to Brooklyn’s Gowanus Lake for last breaths and burial. Brooks takes the gangster part of his role seriously. He never cracks a smile, shows no intentional sense of humor, and remains tough and deadpan throughout his portrayal. This Cheech could never be a man about town. He wouldn’t be sensitive enough to the way people speak, or the workings of the theater. He’s too single-minded as a bodyguard and a hit man. His walk remains stiff, except when Brooks is called down to join the dancers. His face never moves. It retains one expression throughout the staging. There’s no charm, no comic flair, and no way to take a liking to Cheech. Cheech performs one act the audience must watch with a lump in their throat while finding the gambit funny and siding with Cheech about its execution. Brooks doesn’t ket that happen. He engenders no sympathy, no warmth for Cheech. This Cheech is an automaton with a few good ideas about how to make a stodgy play sing. He does not have the variety or the range to talk to David on the level or to see, rather than just hear, his comic objections to Olive’s performance in what becomes David’s and his play. Brooks is a versatile and experienced actor who has the flexibility to play all Cheech offers. Right now, he’s doing a quarter of his part. Brooks needs to lighten up and think of the comic way of presenting his cases to David, Warner, and Olive. His one-note portrayal takes away from the tenor and fun of the musical. Jemma Jane relies too much on voice and character as Olive Neal. While her Olive can be obnoxious and crass to a point you want to do her in, Jane also shows signs of vulnerability behind the crust. Alas, the exterior parts of her character takes over and dominates. The script says Olive improves as an actress as rehearsals for David’s play proceed. You never see any evidence of that in James’s performance or in Whiting’s staging. Like Brooks, Jane can, with some moments of exception, be one-note in her portrayal. Even so, she is engaging enough that when it comes to choosing between Cheech and Olive, you choose Olive, a choice that is not the right one for “Bullets Over Broadway,” and hence causes an onstage dilemma. Rick Grossman is nicely ironic as show producer Julian Marx. Michael Corvino comically shows the yin and yang of loving Olive, who he knows has little talent. Justin Jutras has some amusing moments as a hot dog vendor. The one part of Whiting’s production that consistently rouses and makes one gawk in wonder in the dancing. Stroman and Clare Cook turn the male and female corps into contortionist as hip joints fly in one direction while knees gyrate in a complete circles and hands go jubilantly up in the air. The dance numbers have pace and precision the rest of the production lacks. To a person, the chorus is aces. Some specialty moves really stick out. I wish the “Bullets” program was more explicit about who does what because some chorus members deserve some singling out. Since that is impossible, congratulations and appreciation go to Blaire Baker, Mary Callahan, Jake Corcoran, Elizabeth Dugas, Carissa Fiorillo, Patrick Graver, Andrew Hendrick, Lainee Hunter, Justin Jutras, Brian Martin, Conor McGiffin, Andrew Metzgar, Corinne Munsch, Kaylee Olson, Joey Ortolani, Kelly Peterson, Lexie Plath, and Ian Saunders en masse. I could watch these marvelous loose-limbed, gymnastic performers for days. (Except they’d never survive all the exertion.) “Tiger Rag,” “Tain’t a Fit Night Out for Man nor Beast,” “I’ll Be Glad When You’re Dead, You Rascal You,” and “There’ll Be Some Changes Made” were particular lollapaloozas. I like Allen’s song selection, but some numbers seem to come out of the blue, a situation that was also true on Broadway, and can use some subtler cues. All musical execution in the touring show was fine. William Ivey Long does his usual masterwork on the “Bullets” costumes, Clare Cook rates this extra kudo on her reworking of Stroman’s choreography. Wig and hair designer Bernie Ardia show both wit and a feeling for the 20s in his creations. Sound designer Shannon Slaton did fine work, but as often happens, the mikes at the Academy of Music were set too hot, so Robbie Cowan’s orchestra sounded more recorded than live, and some of the vocals, especially at the top of the show were garbled, giving the false impression the actors weren’t articulating when it was the sound system at fault. “Bullets Over Broadway” runs through Sunday, November 1, at the Academy of Music, Broad and Locust Streets, in Philadelphia. Showtimes are 7:30 p.m. Tuesday through Thursday, 8 p.m. Friday and Saturday, 2 p.m. Saturday, and 1 and 6:30 p.m. on Sunday. Tickets range from $110 to $20 and can be obtained by calling 215-731-3333 or by visiting www.kimmelcenter.org. This entry was posted on October 31, 2015 by nzoren in Theater Reviews and tagged Academy of Music, Bradley Allan Zarr, Bullets Over Broadway, Clare Cook, Douglas McGrath, Emma Stratton, Hannah Rose DeFlumeri, Jeff Brooks, Jeff Whiting, Jemma Jane, Kimmel Center, Michael Corvino, Michael Williams, musical, National Tour, Philadelphia Theater, Rachel Bahler, Rick Grossman, Susan Stroman, Vintage songs, Woody Allen.